After close on three years since initiating the Entsha Scout Programme, and after being successfully tested and evaluated by the Test Pilot Troops around the country, the new Scout Programme is ready to be launched in all Regions. January 2019 will be an exciting period as the Troops convert their Scouts onto the new programme so that they can continue their Scout advancements on the new programme. This can be done by using the excel conversion matrix, or, if your records are up to date on Scouts Digital, automatically. Once you do that, you cannot go back and all your Scouts’ records on Scouts.Digital are converted! This notice is being distributed so that as many aspects as possible in the conversion process are covered and/or discussed. Remember, there will be support from both Region and National, so if there are any issues during the conversion process, there will be someone to assist you. One point that must be emphasised is that Scouter’s discretion must come into play during this conversion process. There could be situations were a Scout feels they are being adversely prejudiced. You, as Troop Scouter, can decide on whether to accept the Scout’s argument or not. The launch date is today, 15th January 2019. However, this does not mean that every Troop is expected to convert today. But once the Troop does decides to convert, all the Scouts will have to be on the new Programme from then on. Troop Scouters can decide when, normally in the first term, would be the best time to do the conversion. As the effect of new programme is understood, there might be cases of several Scouts trying to complete advancement levels on the current programme, who would be disadvantaged by an immediate conversion. 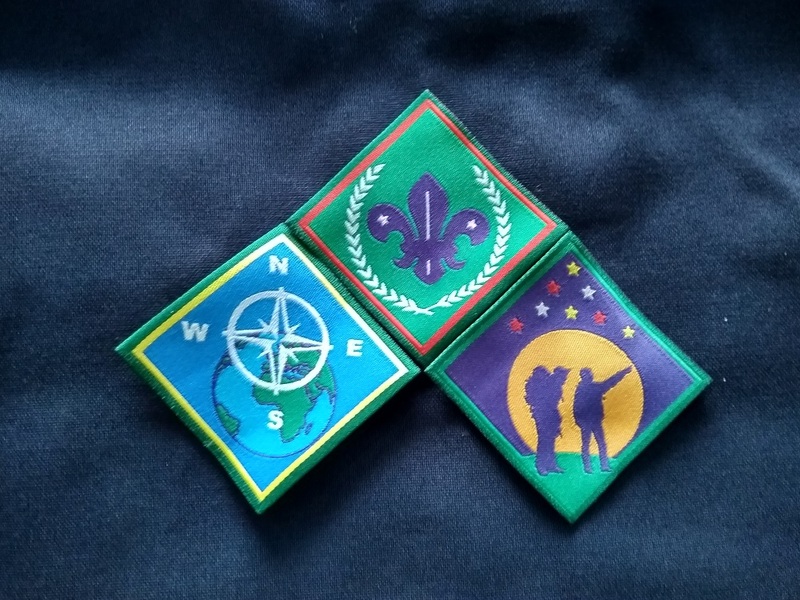 If you, as the Troop Scouter, think that your Troop needs some extra time for several of your Scouts to complete an advancement level, then wait until you feel it is appropriate to convert. However, all Troops should aim to convert during the first term. In some cases, there may be valid reasons not to convert in the first term, but all Troops must have converted by 30th June 2019. If a Troop has not converted by that time their DC will meet the Troop Scouter to facilitate an immediate change over. To convert the present advancement status of your Scouts to the new programme you can use the economic conversion tables, which is an Excel spreadsheet. All final conversion matrix tables will be sent to your RTC – Scout Programme, so please contact them for these tables. They already have final drafts. These will also be available for download on the national website. The RTCs will also have a MS Excel spreadsheet Progress Chart, which will also be on the SSA website. You can use this for recording progress and displaying on notice boards too. Many Groups are now using Scouts.Digital (Version 2). From the 15th of January 2019, Scouts Digital will allow all TS’s & SGL’s to hit the “Big Red Button”. On activation, the advancement of all Scouts will be converted from the old programme onto the new programme. Once converted, the Scout can continue with their advancements. If a Scout has elected to finish their Springbok on the current Scout Programme, their advancement will have to be managed manually. There are instructions in the “read me” section on SD. Please note that either a TS or SGL could activate the conversion, so there must be communication between the two as to when and who will do the conversion. It has been emphasised in the workshops on the new programme that once the conversion has happened, there is no going back. Before conversion, please ensure that all individual records for each Scout are current and up to date. SD is programmed to give credit where credit is due, so out of date records will prejudice the Scout on conversion. The conversion process has been thoroughly tested and should not give any problems. If there are issues, please contact either your RTC – Scout Programme, your Regional SD Representative or me. As a reminder, on conversion, Scouts at these respective levels, will start on the corresponding new programme levels. If there is a Scout that has started working on their Springbok, at the date the Troop converts to the new programme, they have the option to continue the current programme and they have until the 30th of September 2019 to complete it. If it is not completed in that time, they will convert to the new programme. Alternatively, the Scout can immediately convert onto the new programme and complete their Springbok on the new programme. 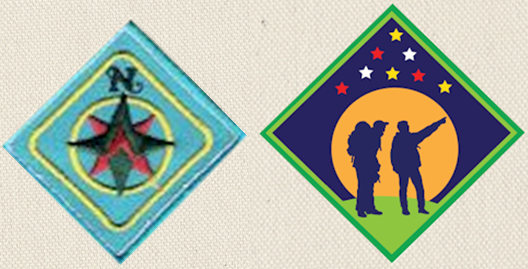 The current advancement badges on a Scout’s uniform are not removed as the Scout has earned those advancement badges. The Scout will start on the next appropriate advancement level and the new advancement badges will just be added. 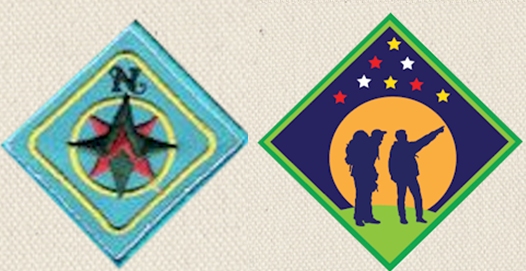 For the next few years there will be a mix of old and new advancement badges on Scout uniforms. Below is an idea of what the ‘mix’ of advancement badges will look like for the next few years. Will work on the Traveller theme badges. Will work towards Discoverer. Does not get the Traveller badge as they did not do all those requirements. Similarly, they do not get the Traveller theme badges unless they have completed the requirements. 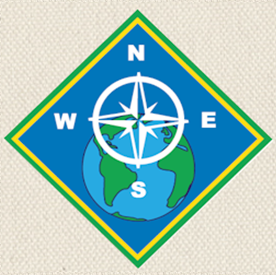 Will continue wearing the Pathfinder badge and add Discoverer badge on completion. Will also work towards Discoverer, but should take less time to complete it as compared to someone on Pathfinder. Doesn’t get the Traveller badge as they did not do all those requirements. Similarly, they do not get the Traveller theme badges unless they have completed the requirements. On completion, can replace Adventurer badge to Discoverer badge. Will work towards the new First Class. Does not get the Traveller or Discoverer badge as they did not do all those requirements. Similarly, they do not get the Traveller or Discoverer theme badges unless they have completed the requirements. On completion, will wear the new first class in the position allocated for it. Will work towards the new Springbok badge or complete Springbok on the current programme by 30 September 2019. Does not get the Traveller, Discoverer or new First Class badge as they did not do all those requirements. Similarly, they do not get the Traveller, Discoverer or First Class theme badges unless they have completed the requirements. 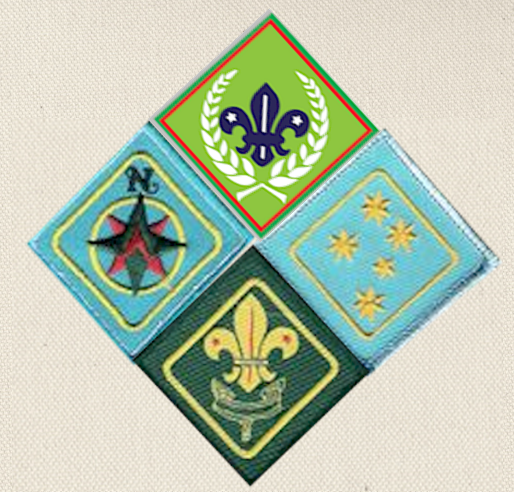 As you are aware, there are six theme badges that a Scout will have to achieve for each advancement level. There is a specific placement for each theme badge, so they cannot be randomly sewn onto the sleeve. Please ensure that the Scouts do adhere to the badge placements. A diagram for the theme badge placements can be seen below. Even though all the badges shown below are for the Discoverer level, please remember that this is a matrix based programme, so one could see other colour theme badges. It is crucial that the theme badges are sewn on neatly. Having the badges sewn on skew or badly does not portray a good impression. 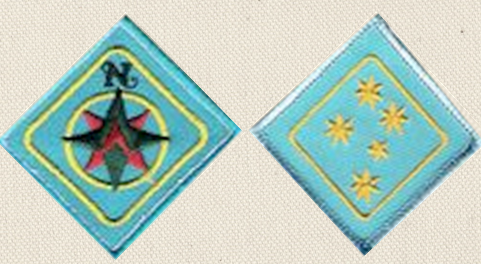 Please refer to the Uniform Policy as to where and how the theme and advancement badges are sewn. All interest badges (Explorer badges), currently on the right sleeve will have to be transferred to the left sleeve. Only theme badges and advancement badges will be on the right sleeve. For further details, please refer to the Uniform policy. It will be noted that Scoutcraft and Interest badges are an integral part of the new programme. 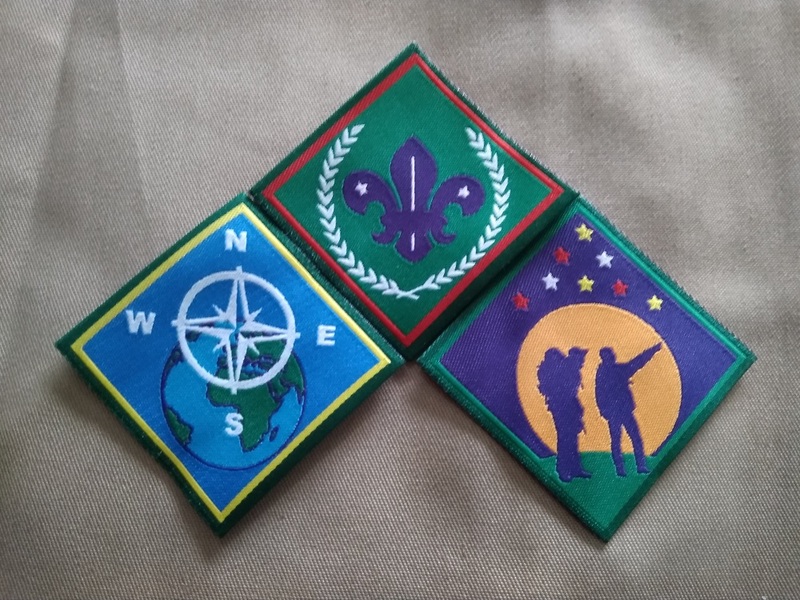 As such there might be cases where a Scout might have to do some Scoutcraft or Interest badge ‘catch-up’. This should not hinder the Scout’s progress too much. 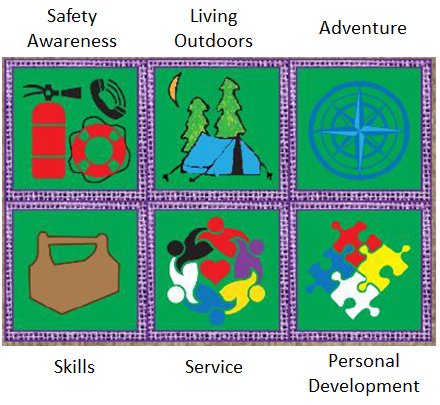 The second issue to be aware of is that some scoutcraft and interest badges are options in different theme badges. If a Scout completes an interest badge for one theme badge, this does not mean they will get that credit for another theme badge, they will have to select another interest badge. 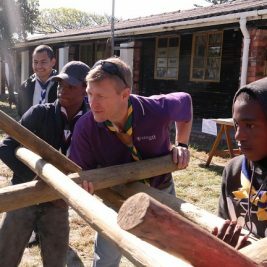 The Scout Trail is available on the New Scout Programme page on the SCOUTS South Africa website. The printed Scout Trail and Scout Handbook – in colour – will be available at the beginning of March 2019. Your local Scout Shop will be getting stock, or you can order online. If there is a problem, please consult with your RTC – Scout Programme. The “Adult Member Working Kit” lever arch files and spine labels, are already available. The contents list and the first modules of the Troop Scouters Working Kit will be available early March 2019, with more to follow. These can then be inserted in your files. This conversion onto the new Scout Programme should be easier compared to other programme launches due to the training that has been given in each Region and the ongoing training being conducted by the Regions. The conversion matrix is available to help: transfer Scouts to the new advancement system and if you have up to date records in Scouts Digital, the conversion is the press of a button. There might well be ‘issues’ on conversion as some Scouts might feel disgruntled in some way. Again, it is emphasised that Scouter’s discretion must come into play. Please be fair in this regard, as some might take the opportunity to get credits that they are not entitled to. Remember that if there is an issue that you cannot resolve, please liaise with your RTC – Scout Programme. Remember, this conversion is a once off occurrence. To all those test pilot Troops that assisted over the past three years: I do give my appreciation for all the hard work and giving the vital feedback to ensure the new programme is relevant and progressive to the SA Scouts of today.